Almond milk was used as a milk substitute in the Middle Ages. It's easy to make your own today using ground almonds and water. The history of almond milk dates back to the Middle Ages. Before refrigeration, the best way to preserve milk was to make butter or cheese. If a cook wanted to use fresh milk in a recipe, they had to have access to a cow, goat, or other milk producing animal. They couldn't trust milk purchased in the marketplace, which might be watered down or spoiled. Unlike animal milk, milk made from ground nuts steeped in water was easy to produce and did not readily spoil. Cooks could store almonds for long periods of time, only making them into almond milk when necessary. Like animal milk, however, almond milk has a high fat content. This meant that it could be used to make butter. One popular dish using almond milk was blancmange, a pudding with Arabic origins. Early European versions were made with almond milk, rosewater, and chicken or other poultry. Modern blancmange is a sweet pudding flavored with almonds, although with a base of milk or cream and usually thickened with gelatin. As lactose intolerance is increasingly becoming a problem, many people are looking for milk alternatives to add to their diet. Milk alternatives often include rice milk, soya milk and almond milk. The benefits of adding almond milk to your diet include the fact that it not only tastes great, but almond milk is also extremely healthy and very good for you. It is an excellent source of unsaturated fat (which is the good type), it contains good levels of vitamins and minerals, and may even help with weight loss. High in protein and omega fatty acids, almond milk contains no cholesterol or saturated fat, and has high levels of vitamin E, zinc, magnesium, potassium, calcium and iron. Other benefits of almond milk are that it only contains 70 calories for eight fluid ounces. Although it has no fiber, almond milk is low in carbohydrates and high in protein, so ideal for anyone following a low carbohydrate diet. Studies have also shown almonds can help with weight loss if they are eaten in moderation. Almond milk contains excellent levels of calcium, magnesium and vitamin D. These all work together to help prevent osteoporosis as we get older. Several studies have shown the importance of taking these supplements together to counteract the effects of bone degeneration as we age. Some recent research also suggests these three in combination may also be a factor in preventing the onset of Alzheimer’s disease. Award... I'm happy to received the summer fun award. Thank you so much, http://angellovescooking.blogspot.com for this honor. Blend together strawberries, bananas, almond milk and sugar. Chill before serving. Enjoy! A drink with some of my favorite fruits. Yummy. I used to only drink soy milk. Lately I have been switching from Almond milk and coconut milk. They each have their own consistency and taste. Great to use with smoothies. This looks like a wonderful breakfast! Thanks for the information on almond milk. Wondering, have you made your own, or do you use store-bought? Congratulations on your award! I had no idea almond milk can be made by hand....it makes it a perfect long-term food! As I blog my boyfriend is sitting next to me begging me to make him this drink!! Looks really good! I love the history always a treat to get some education while blogging!! No, I haven't made almond milk yet. This recipe I used store bought. What a great snack... or breakfast! If you make this drink, let me know what y'all think. Strawberries and banana really make a great drink! Loved this drink...so colourful and refreshing!!! I used this combination in my popsicle recipe too, and the result was awesome!! I just started buying almond milk recently and I really like the taste of it. This drink looks yummy! this is totally a refreshing drink looks great! My son has just started at the University of Colorado at Boulder. He says that at his hall 'chocolate milk' is on tap. I can't help but think your recipe is healthier! hi christine, sure taste delicious especially chilled, simple to prepare but is a great idea- using healthy ingredients. thanks for the added knowledge i gained on your almond milk info and health benefits write up :) appreciate this. This drink is a lot healthier then chocolate milk. This sounds delicious - love that you had almond milk in there! So yummy! I love Almond milk and i bet it tastes incredible with the strawberry! I've never heard of almond milk. What a great way to use it! Classic combo, sounds so good Christine! I haven't used almond milk but it sounds like it makes a good addition to this! I like your idea to use almond milk to make milk shakes and smoothies. Nice! I love smoothies with bananas and strawberries, so I bet this is delicious! I have tried almond milk before but I love rice milk. Great to know the benefit of it to our bone and health. The smoothies sounds wonderful! What a healthy and delicious drink that is! Strawberry Banana Fruit Drink = YUMMY! I like to take a moment and thank y'all for all the comments. Y'all mean a lot to me. And your comments mean a lot to me. We love the almond milk, and it's rich and creamy, more than the soy milk we have found. It makes wonderful smoothies and drikns, like yours. I'm tagging you for the 7 links Challenge, please visit my blog and check it out. I would love to see your lineup of amazing recipes. Congrats for winning an award. I know I for one enjoy learning something new on your blog page when I visit. 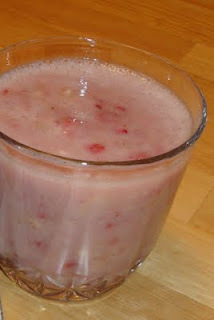 Love the idea of a Strawberry Banana drink made with almond milk. that is a great use for almond milk!